When you want to turn your story/novel into a screenplay, do you know what to do? Just get the novel and simply insert the elements of a screenplay in it, that's all! Before you do the above, you must first work on your novel and make it screenplay-worthy. You need to handle these points below. (1) Decide on the length of the screenplay you wish to obtain. The duration of a feature film depends on the number of pages of its screenplay. A page with courier font style, and font size twelve is equivalent to one minute of screen time. Sixty pages is equal to one hour. A normal feature film should be about ninety pages, that is one hour and thirty minutes of screen time. The reason for this analysis is that not everything in your novel should be in the screenplay; you need to cut somethings out. Or the other way round, if your novel doesn't have enough content to make a feature film of one about hour thirty minutes, then you need to add more content to the screenplay. In both cases, you can adjust (increase/decrease) the number of characters, actions, dialogues, scenes and props. Sometimes this proves difficult as it's not easy to just eliminate some characters because it may affect the whole story and consequently may cause frustration to the writer. Anyway, a way out is to eliminate unimportant scenes, and then say what happened in the scenes through the dialogues. As the unimportant scenes are eliminated, some characters that appeared just only in those scenes are automatically deleted. Again you need to choose the dialogues that pulsate with actions. You must not necessarily start in your screenplay the way you started in your novel. But make sure whatever you do does not disorganize your story. Meanwhile, it is easier to turn a piece written in drama form into a screenplay than that written in prose form. Turning your novel into a screenplay may be easier for you when you first convert the prose to a drama. This may be a long process though, but it's useful. 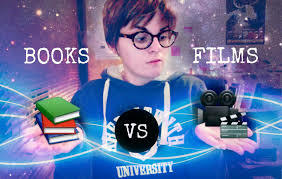 Learn more about the differences between 'to adapt a book into a screenplay' and 'to turn a book into a screenplay' here. A screenplay is just like the novel/story which you have written, but the only striking difference is that what you would write in a screenplay is more organized and arranged using a format. That is to say it's freer to write all the words you have for your novel, but for a screenplay, there are rules guiding you. You are no longer free to write those words anyhow you like, but you must learn the format with which you must write and hence be guided by it. Screenplay could be defined as a story/novel whose wordings have been classified and placed in separate profiles using a stipulated format. The profiles are the elements of a screenplay and they are arranged and presented in a format. they have a format with which they are presented, and they serve as the profiles in which the wordings from your story/novel are placed. (E) the time and place/position at which their actions take place. While turning your novel into a screenplay, all of the above listed features of your novel must fall into a particular profile/element of a screenplay. Various other features may come up and the elements of a screenplay is enough in number to accomodate the features. Every word you inject in a screenplay must fall into a particular element to allow a proper format. The reason and need for this format is to enable the writer to write his story they way it should appear on the TV screen, to enable the actors learn and master their roles very well, and to enable the film-maker to schedule the shooting using various fim-making tools, shots and props at various locations with selected actors. The aim of a screenplay is to get whatever words and actions in your story/novel to the TV screen so that all the details contained in the novel, some of them which the readers only imagined how they were carried out by the characters can be seen live on the TV screen. The format for a screenplay serves as a template which roles out sequentially with explicit details of the scenes present in the screenplay from the very first scene to the very last one. So the main tactics for writing a good screenplay is to write it the way it's supposed to be perceived by the audience when they watch the movie on the TV screen. This means you are writing for the audience who are sitting before a TV screen! Show don't tell! (i) Scene heading describes where and when a particular scene is taking place. It consists of the exact location (either interior or exterior of that location), and the exact time at which the actions in that scene hold. (ii) You have to write the scene heading in such a way a screenplay reader sees himself right inside the scene. This happens when the scene heading is descriptive enough. (iii) Write the actions as they should appear on tv screen. This means your verbs must be in present tense. (vii) All actions must be written in real time as they occur. (viii) Avoid using indirect descriptions, figurative expressions, phrasal verbs. Just be go straight to the point. (x) Make the dialogues very engaging between and among the characters.